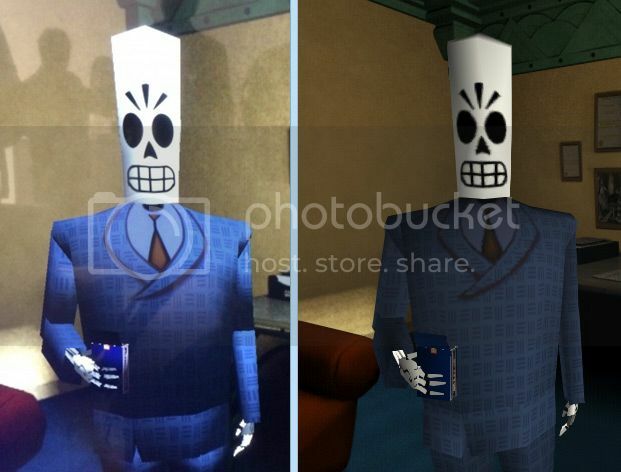 Post subject: Grim Fandango Remastered being made by Double Fine! It crossed my mind that there might be people visiting these forums, looking for a modern take on Grim Fandango, who might not be aware that an OFFICIAL project to do just that has been announced -- by Tim Schafer himself! This fan-made project has pretty much stopped development until that version has been released... hopefully it will be so incredibly awesome that it will render this project pointless. Are these from DoubleFine's development? If they are, I'm a bit disappointed that they're doing more or less the same thing that we were. I was hoping for optimized 3D models at least (ones where the arms aren't detached from the bodies), instead of the original chopped up ones. The improved Manny looks a lot like the one we made, though to be fair, not much else could be done without ruining the original feel. EDIT: In hindsight this seems like a hater's overview. Don't get me wrong, I've loved what DoubleFine were/are doing ever since Psychonauts, but so far this feels like half a cake. Hmm. It's VERY disappointing if they're not even doing to fix the terrible hands on the models. At this rate Grim Fandango Deluxe will still very much be in business once the Remastered version is out, which is a shame. I had dreams of the models looking absolutely wonderful, but instead they've been (very nicely) retextured and the engine has had its lighting improved. I hope that's not the end of things. Of course, it's still early days, but... Damn. What's the estimated release date? Maybe it's just that at this stage they have artists working on new models, and the backgrounds need rerendering, or more work in the engine, but the textures were an easy fix. The lighting or the model normals seem messed up too, because you can see out-of-place shadows in the places where the objects come together, e.g. the elbows. I just can't believe they are sticking with the old models from 1998... So it appears GF Deluxe will still have it's relevance after all. It's surprising and disappointing, isn't it? The models weren't great back in 1999. It's not like anyone is going to complain that Manny's sleeve isn't a rectangle anymore. I think they took the "purist" route a little too far. To get to this simple screen they had to port the renderer, main loop, and display code over to the PS4, which can take quite a bit of work. After that is done, upgrading the resolution of the textures is not that much work. Adding more polygons requires (at the very least) that they get their original asset production pipeline working again, if not a renderer rewrite to better fit the PS4's architecture. So better models might still come! My guess is that they'd at least change the model format as the current one they have is not really suited for modern graphics architectures. Converting the animations (without cleaning them up) could be a bit tricky though, but not impossible, there are a lot of formats out there that support skeleton animations, keyframing, even blendshapes, as you guys certainly already know! Seeing as we've done this before, the only problem that I can see is the videos. Otherwise they really could have improved them. Reworking the models (while keeping them as separate pieces) is not that big of a deal, and they do have talented artists there. Also, polygon count does not necessarily have to get a lot bigger, polygons just need to be utilized a bit better, and the rest can be taken care with normals. Even if it did get higher, I expect it to be not more than 30% (Although today's machines should easile handle even 300%). I think they're concerned about matching the cutscenes... but, if anything, Grim Fandango Deluxe showed you quite some leeway when it comes to the models. I never thought they clashed when I played with our Manny, and he's pretty different from the cutscene version.